The winner of the thirty-fifth Lyttoniad is Kat Russo from picturesque Loveland, Colorado. Kat describes herself as having twenty-six years of experience in covering social awkwardness with humor and stories about her cats. She spends her time working in outdoor retail and at a wildlife rehabilitation center while trying to figure out how to use her art degree. Conceived to honor the memory of Victorian novelist Edward George Earl Bulwer-Lytton and to encourage unpublished authors who do not have the time to actually write entire books, the contest challenges entrants to compose bad opening sentences to imaginary novels. Bulwer was selected as patron of the competition because he opened his novel “Paul Clifford” (1830) with the immortal words, “It was a dark and stormy night.” Lytton’s sentence actually parodied the line and went on to make a real sentence of it, but he did originate the line “The pen is mightier than the sword,” and the expressions “the almighty dollar” and “the great unwashed.” His best known work, one on the book shelves of many of our great-grandparents, is “The Last Days of Pompeii” (1834), an historical novel that has been adapted for film multiple times. As we read ’em and weep, we might send amusing birthday greetings to Ernest Lawrence Thayer; he was born on this date in 1863. A Harvard classmate (and Hasty Pudding and Lampoon colleague) of William Randolph Hearst, Thayer was recruited by his friend to the humor columnist for The San Francisco Examiner, 1886–88. 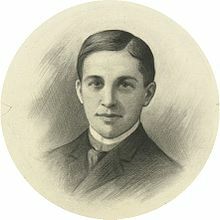 Thayer’s last piece, dated June 3, 1888, and published under his pen name “Phin,” was a ballad entitled “Casey” (“Casey at the Bat”) which made him “a prize specimen of the one-poem poet” according to American Heritage. The first public performance of the poem was by actor De Wolf Hopper on this date in 1888, Thayer’s 25th birthday. Thayer’s recitation of the poem at a Harvard class reunion in 1895 finally settled the question of its authorship.